American 3 Way-Luxfer Prism Co. The timeline of Luxfer History is found at luxfercylinders.com. This begins in Massachusetts in the 1880s when James G. Pennycuick secured a patent for illuminating tiles to be used in vault covers. From Massachusetts Pennycuick moved to Toronto, Canada, then to Chicago, Illinois, where a company initially called the Radiating Light Company became the Luxfer Prism Company, to manufacture "prismatic tiles." The name was changed to the American Luxfer Prism Co. in 1898 after Luxfer established a subsidiary in London, England. That same year the American Luxfer Prism Co. opened offices in New York at 160 5th Ave. Offices for the American 3-Way Prism Co. were established in New York in 1908 at 949 Broadway. James Gray Pennycuick (c.1833-1901) was born in Scotland and died in Ontario, Canada, 9 January 1901, age 70. In the 1880 U. S. Census he was recorded, age 47, living at 247 Walnut Avenue, Boston, Mass. His occupation was "Works in Reflector Co."
James G. Pennycuick's 1881 patent for "Tile for Illuminating Purposes" is available at glassian.org. 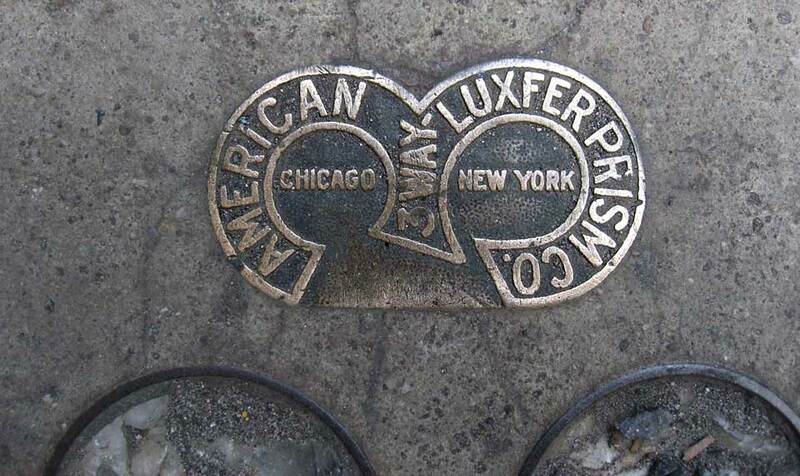 American Luxfer Prism Co. and American 3-Way Prism Co. were competitors until the 1920s when Luxfer was bought by American 3-Way Prism to form the American 3 Way-Luxfer Prism Co.. In New York the merged company appeared in directory lists at 139 Spring St. The company relocated to Long Island City for several years, then came back to midtown Manhattan in the late 1920s. They appeared in the Manhattan telephone directory until the mid-1950s. The website glassian.org includes excellent information and images for the Luxfer Prism Company, the American 3-Way Prism Co., and the American 3-Way Luxfer Prism Co. This ad for the American Luxfer Prism Co. appeared in the Catalogue of the Fifth Exhibition of the Brooklyn Chapter of the American Institute of Architects, 1905. American Luxfer's New York offices were located at 160 5th Ave. from 1898 to 1907. Sweet's Indexed Catalogue of Building Construction for the Year 1906, published by the Architectural Record Co., contains a description of the American Luxfer Prism Co. This work is available on Google Books. There is also a description (shorter) for the American 3-Way Prism Co., also available on Google Books. This ad for the American Luxfer Prism Co. appeared in The American Architect, 1909. The New York offices at that time were at 507 West Broadway where they were located from 1908 to 1917. This ad for the American Luxfer Prism Co. appeared in the Dry Goods Reporter, vol. 43, no. 46, 15 Nov. 1913, p 32. This ad for the American 3 Way-Luxfer Prism Co. appeared in the Year Book of the New York Society of Architects, 1922. The address of the new merged company is 139-141 Spring St. This was their address from 1918 to 1922. The American 3-Way Prism Co. entry in Sweet’s Architectural Catalogue, 1917, reads, American 3-Way Prism Co., Distributors of Daylight, Eastern Office and Factory, New York, N. Y. Products: Prism Glass: 3-Way Pressed Prism Tile; Glazed Tile Transom Lights with Plain or Colored Ornamental Border; Transom Ventilators with and without Screens; Sidewalk Lights, Floor Lights and Skylights, including Fresnel Simplex, Screw Glass Simplex, Standard Simplex Vaults Light and Skylight Constructions, Paschall Interlocking Vault Light and Skylight Constructions, Ransom Reinforced Concrete Sidewalk Lights and Floor Lights; Doors and Specialties, including Flush Watertight Sidewalk Doors and Coalhole Covers. Also, Flat Back Pressed Prism Tile, Flat Back Sheet Prism, Wired Sheet Prism, Glazed Sheet Prism for ornamental designs, Canopies of Pressed Prism Tile, Diffusing Sash of Pressed Prism Tile or Sheet Prism; Cast Iron Vault Light Constructions, Extension Skylights; Vent Doors, Sidewalk Grating and other cast iron paving and sidewalk specialties. Illustrated in Sweet's 1917 are vault light construction of the Paschall and Simplex types. The American Luxfer Prism Company entry in Sweet’s Architectural Catalogue, 1917, reads, American Luxfer Prism Company / Prisms for Lighting Buildings with Daylight / Main Office, 29 East Madison Street, Chicago, Ill. / . . . / Branch Office, New York, 507 West Broadway. Products: Original Luxfer Products are manufactured exclusively by us and comprise Luxfer Prism Transoms and Windows; Luxfer Prism Canopies and Extension Skylights; Luxfer Prism Floor, Ceiling and Roof Lights; Luxfer Vault Lights; Luxfer Sheet Prisms; Luxfer Prism reinforced Concrete Sidewalks; Luxfer Read-to-Set Sidewalk Light Slabs, and Luxfer “Crystolux” Non-Slip Sidewalk Finish. This ad for the American 3-Way Prism Company from 1918 announced their removal from La Porte, Indiana, to Cicero, Illinois. Their New York address at the time was 94-96 Wooster St. The American 3 Way–Luxfer Prism Co. entry in Sweet’s Architectural Catalogues, 1933, reads, American 3 Way-Luxfer Prism Co. / Daylight Engineers / 1301-1305 South 55th Court, Cicero, Ill. (Suburb of Chicago) / 517 West 45th Street, New York, N. Y. "3 Way Armored Sidewalk Lights (Glass Guaranteed for 5 Years) Daylight in basements and vaults is more important today than ever. Sunlight and daylight make for health and efficient operations. 3 Way Armored Sidewalk Lights accomplish this in more of a permanent way than any other light medium we know of. Abundance of daylight. Lasting qualities in construction. And practically no maintenance cost." Illustrations in Sweet's 1933 include 3-Way Armored Sidewalk Lights and a section drawing of waterproof construction. 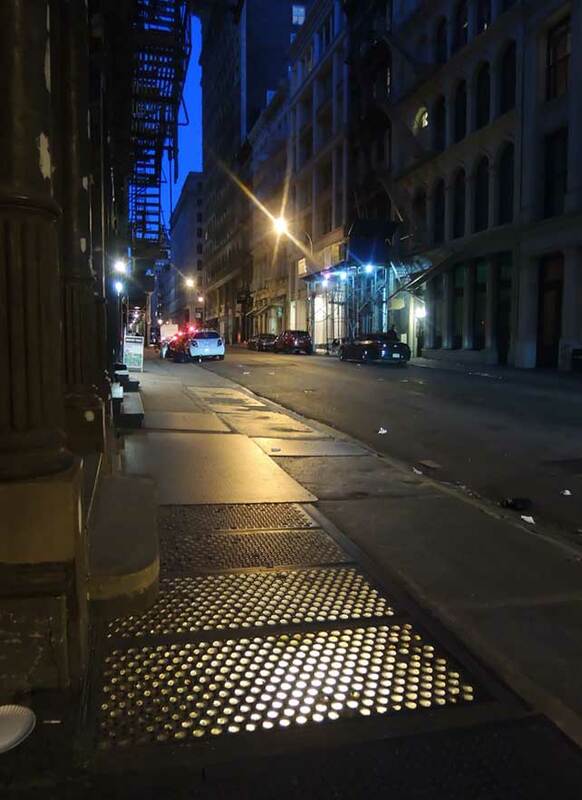 Other Luxfer Prism vault lights in downtown New York are found at 40 Walker St. and 96 Duane St. In May 2014 vault lights within a few feet of the Luxfer vaults on Walker St. glowed with light beneath.